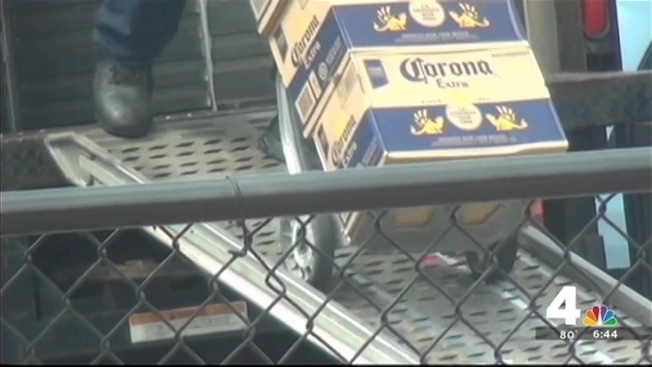 Beer Bust: Is Montgomery County Liquor Control Getting Worse Instead of Better? The next time you order a glass of wine or a bottle of beer in Montgomery County, will you actually get it? A growing number of restaurants say "maybe not," and they’re blaming the government. Mike Jones of American Tap Room in Bethesda recently invited the News4 I-Team to his restaurant to show why he thinks Montgomery County’s Department of Liquor Control is hurting his business at a key time as the weather brings in more customers. The I-Team was shooting video in the back of his kitchen when, unexpectedly, a DLC deliveryman showed up with a case of Grey Goose. “We never ordered Grey Goose,” Jones told him. This kind of mix-up, Jones said, has become his weekly chore. Jones said he doesn’t even order hard liquor from the county warehouse anymore, choosing instead to walk across the street to the county-owned liquor store to make sure he gets what he actually ordered. "It's getting increasingly worse,” he said. "This has been one of the most frustrating processes I've ever been involved in, where you're almost pleading and begging with officials to get something done." Jones stocks dozens of wines and spirits in his bar, but the restaurant's main selling point is the 20 taps featuring a rotating list of local craft beers. Those taps now regularly run dry because the county doesn’t deliver what he needs to keep them flowing, Jones said. "Allagash White is a keg we didn't see for a whole month,” he said. “When it did arrive, 'cause we asked for it every week, four kegs arrived. But we didn't need four, we just needed one." Jones and other business owners said the problems started in February, when the county installed a new online ordering system. On the day the I-Team visited, American Tap Room Bar Manager David Warren showed how even though the computer said all of the alcohol he ordered was in stock, he only received half of what he wanted. Liquor Control "Completely Broken Down"
"You can never plan for anything," Warren said. Instead, he pointed to the kegs and boxes of beer and wine they didn't order that are now piling up at the back door, waiting to go back to the county's warehouse. The county deliveryman who brought the wrong box of Grey Goose told Jones and Warren he couldn’t take the pile back on his truck because he didn’t have the right paperwork. According to testimony from recent County Council hearings, Montgomery County is the only local government in the nation with a complete monopoly over the sale and distribution of all wine, beer and hard liquor. Distributors must deliver everything to the county's warehouse, which then uses government employees to redistribute it to roughly 1,000 restaurants and privately-owned beer and wine stores. After the News4 I-Team's investigation into theft and inventory control, the agency promised many of its problems would be fixed when it switched to a new Oracle computer system in February. But since then, more than a dozen businesses have testified at County Council hearings the new system actually made things worse. "I want to know what they're going to do,” Jones told us. “We live and die by what they're doing." Montgomery County’s Karen Plucinski, who is in charge of implementing large computer systems for the county, told the I-Team, “We understand their pain, we hear their pain, we're really looking to do things differently, get their input and make changes as we go." Plucinski explained it typically takes three to six months to iron out the kinks. "Anytime you go through a large implementation of this size, we have growing pains and it takes several months to be able to go through and figure out how we can do things better," she said. She said they're improving every week by eliminating cash sales and enabling licensees to order online. DLC demonstrated how county employees now can more efficiently track when they’re running low on supply using the Oracle system. And Plucinski highlighted how the warehouse has started using handheld scanners to track the alcohol as it is coming in and out of the warehouse. "That electronic scanning is going to help a lot," said DLC Director George Griffin. But he admitted, "It's been very challenging because a lot has happened at once." Griffin said they’ve been planning the new system for two years and launched it in February because that's traditionally a slow month for restaurants and stores. The Oracle system and its rollout are expected to be the main topic of discussion at Friday’s County Council hearing. Griffin promised to be there. "I will say we're better today than we were when we went live," he said. "So there have been improvements, so that's encouraging."